Statements of responsibility: Print by Art Engraving Co. This item is a print of a drawing by Major J. S. Matthews. 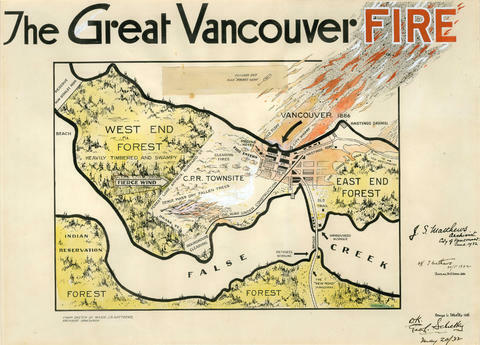 The annotation on the photographic print reads, "This drawing was started in 1931, in which there were living in Vancouver at least fifty persons, men, women, children grown to adults, and Indians, who had either fled from the fire of 13 June 1886, seen it from a distance in all directions, or help [sic] to succor the distressed. Most of these were interviewed in 1931-1932, and their stories are recorded in the typescript volumes of 'EARLY VANCOUVER', Matthews. The most informative is in Volume One, pages 267 to 316. After about a year of endeavor I drew this drawing, and asked Mr Thomas Mathews and Mr George L. Schetky to sign it, May 20, 1932, as accurate. 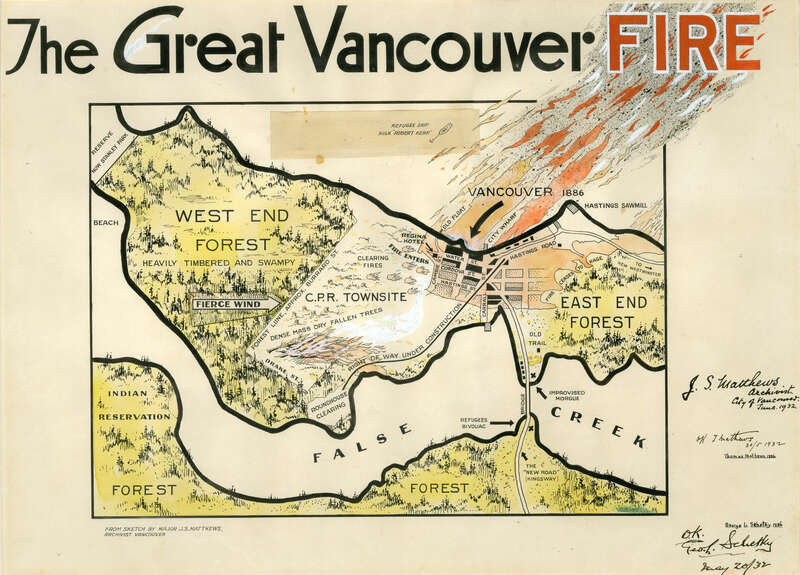 One lady, who saw the fire from a small boat in Coal Harbour, described it as 'A GRAND BUT AWFUL SITE'. J.S. Matthews, City Archives"